Previous studies have already shown that crows’ planning skills are sophisticated enough to allow them to solve puzzles in several stages and to use a tool (a stick) to obtain food. The current study investigated whether the birds could build an object themselves to be used as a tool to obtain food. The scientists studied eight New Caledonian crows (4 females and 4 males, all at least 3 years of age) in a multi-stage protocol. The scientists first tested the birds on a new puzzle that they had to solve in order to receive a food reward. The crows were presented with a transparent container with a narrow slit on one side. Sticks were scattered around the box. In no time, the birds had figured out that all they had to do was insert one of the sticks into the slot to push the food out of an opening located on the other side of the box. In this first familiarization phase, all of the sticks were long enough to be used for the task. Then, in the first construction test, the sticks were replaced by two cylinders that were too short to reach the food. But the cylinders (of different diameters, some hollow and some solid) could be put together. Some were placed on a wooden panel to help facilitate assembly. Of the eight crows, Tumulte, Tabou, Mango, and Jungle were able to quickly assemble the cylinders (in 4-6 minutes) and transport their tool back to the box containing the food. Note that the crows assembled the cylinders without any prior learning, simply by trial and error. They could then move on to the third phase of the protocol (transfer) where they were given materials (straws and pipe cleaners), haphazardly arranged on the wooden panel and on the floor. With two tries at most, and in less than five minutes, the four crows were again able to build tools to collect the food. 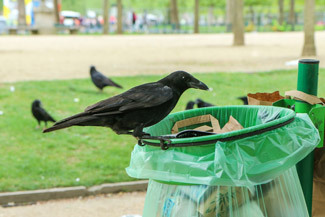 In the final phase of the experiment, the scientists made the test even more difficult by presenting the crows with shorter components (so a two-part assembly was no longer enough to obtain the food reward). Only one of the crows, Mango, was able to assemble and use a three or four-part tool. This is no small exploit, as the authors remark: “this multi-compound tool construction required dexterity and perseverance. […] The finding is remarkable because the crows received no assistance or training in making these combinations, they figured it out by themselves.” While the mental processes that allowed the crows to build a tool are still unclear, it is nevertheless an incredible ability that exceeds even the current findings for non-human primates (who were given a demonstration beforehand and who created tools with only two parts).